Emma Harper MSP (left) and I standing in front of the BES Scottish Policy Group stand at the LINK Parliamentary Reception. 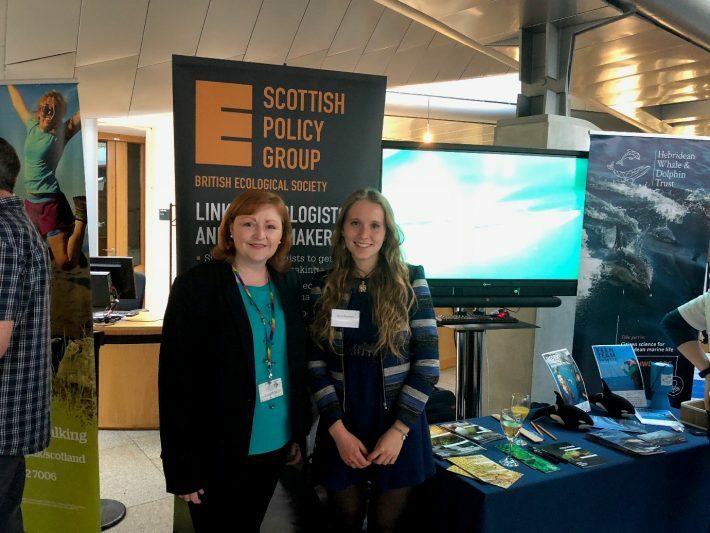 I recently had the privilege of attending the LINK Parliamentary Reception in Edinburgh as a young and active member of the British Ecological Society. The reception was held in the Scottish Parliament Building and celebrated young environmental campaigners from a range of organisations such as Young Friends of the Earth, 2050 Climate Group and the Hebridean Whale and Dolphin Trust. The Scottish BES policy team had one of a number of information stands at the event, explaining the important work they do and encouraging people to become members of the BES. It was incredibly exciting to attend an event held in a Parliament building and to be surrounded by so many enthusiastic environmentalists and inspiring organisations. I also had the opportunity to speak to Members of Scottish Parliament, including Graeme Dey MSP and Emma Harper MSP (see picture) who told me about the work they do in government to help look after the environment. Being involved with the BES is a great way to keep up-to-date on important topics and issues in ecology, as well as giving you the opportunity to attend events and network with likeminded people. I first got involved with the BES when I attended the BES Undergraduate Summer School in 2016 which took place at Malham Tarn in Yorkshire. The focus of the summer school was to broaden our knowledge of the different types of careers available in the ecology and conservation sector. We were also given help with our CVs, learnt species identification skills and were able to attend bird and bat walks. The whole experience was incredibly valuable for developing my passion for ecology and for enabling me to learn from both PhD mentors and the range of speakers that gave us an insight into their careers. The beautiful setting and warm weather made it even more enjoyable too! After attending the summer school, I was keen to stay in contact with the BES and get more involved with other events taking place. At the end of my second year studying Biology at the University of Nottingham, I applied to be one of four students to organise the 2018 BES Undergraduate Careers Conference. The whole process ran from July 2017 until Monday 12th February 2018 when all of our hard work paid off at a very successful conference. The event took place in Charles Darwin House in London and 80 students attended along with the speakers who had graciously given up their busy schedules to be there. The topics covered ranged from careers in the charity sector (Mathew Frith, London Wildlife Trust) to careers in ecological consultancy (Nick Sanderson, RammSanderson Ltd) and policy (Vicki Hird, Sustain). Helping to organise the conference enabled me to work with three other enthusiastic and dedicated students with guidance and help from the BES Education Manager, Amy Padfield. It was a lot of fun to be so involved in organising a large event and it was very rewarding to see it run smoothly on the day. In the future, I am hoping to maintain my involvement in the BES through applying to be a Student Helper at the Annual Meeting and by keeping up to date with any other events or committee positions that are advertised. My advice to other young people who want to gain experience of working with a learned society is to apply for every opportunity that comes your way. There really is nothing to lose by putting yourself out there and trying new things (even if they seem daunting at the time!). I know that I have definitely gained more confidence through these experiences and I have also learnt so much from the hard-working and dedicated people I have met within the BES. Last week we celebrated National Careers Week, an initiative to recognise and promote careers guidance so that students leaving education can make informed choices about what they do next. A summary of the talks and discussions held at the BES Conservation Group event on 20th February 2019, which tackled key questions for ecologists arising from the Brexit process.